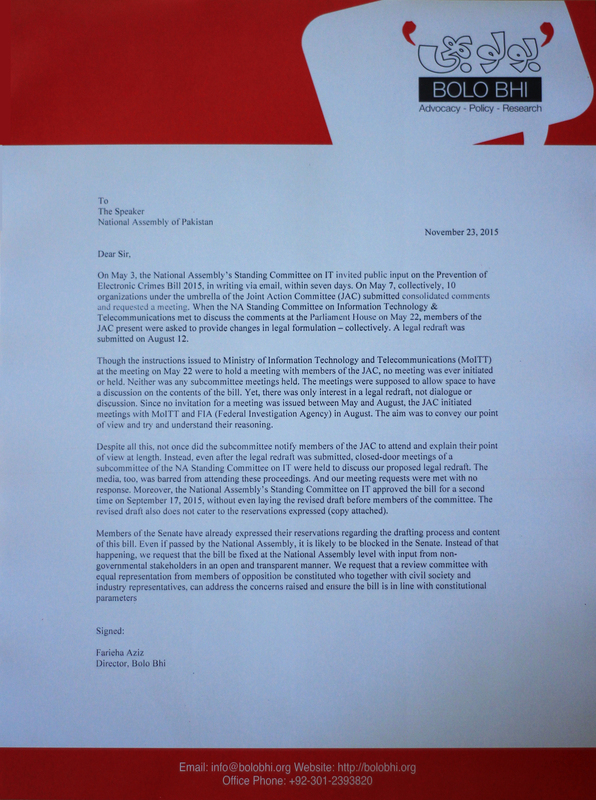 Citizens of Pakistan have grave concerns regarding the government’s proposed Prevention of Electronic Crimes Bill. Despite reservations that have been raised at public forums, in the media and sent in writing addressed to the Standing Committee on IT, and through members of parliament, the bill has been approved a second time by the Standing Committee and now moves to the floor of the assembly for passage. In its current form, the bill will have a detrimental effect on civil liberties – particularly citizens’ right to speech and privacy. It will also adversely impact businesses – particularly the ICT sector which is a flourishing industry. Under the Rules of Procedure and Conduct of Business in the National Assembly, the Speaker can take up matters of public importance. Write to the Speaker and let him know you are concerned about the bill and do not want it to be passed in its current form. Ask that a committee be formed to revisit the bill, which takes input from members of opposition, public and professionals. Even if it means going back to the drawing board. It must be done in the interest of the people of Pakistan. Here’s the Letter that we at Bolo Bhi sent to the Speaker. Copy+paste, add your name and send. You can also write your own letter. I am a Pakistani and I am concerned. The PECB needs to be reviewed and debated again before being passed. It is strangling our liberties in a democratic country. I’ve sent by post. Thank you for this forum to share this info and provide a way to raise voice for liberty. In my opinion abusive language on all social media should be stopped at once even if you are objecting or criticising the government however objections and criticism must be welcomed by government or its official or politicians and public figures. The one using abusive language should be punished. As a citizen of Pakistan I am deeply concerned about the government’s proposed Prevention of Electronic Crimes Bill 2015 (PECB). In its current form, it will have an adverse impact on our constitutional rights to speech and privacy, and the right to do business. We urge you to take notice of this matter of public importance to ensure the bill is not passed in its current form. We urge you to constitute a review committee with an equal number of members of opposition that revisits the bill and takes input from members of public and professionals, in an inclusive and transparent manner, in keeping with the true spirit of democracy. Email sent but does it really make a difference? I think a better solution would be to promote ideas like TOR Browsing. tThis bill will not promote security but will take away our fundamental human rights and must be reviewed, thoroughly debated and amended before being passed. I reject the proposed bill in its current form. i reject the bill in its present proposed form.